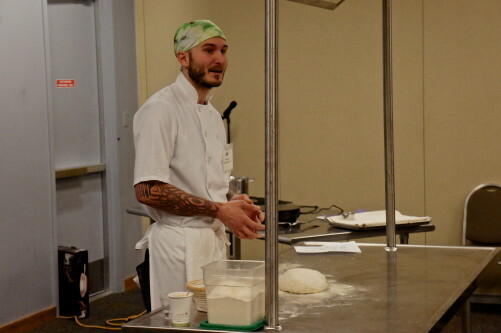 Greg Wade, the head baker for Chicago’s Publican Quality Bread and the One Off Hospitality Group, conducted a Master Class in bread baking at FamilyFarmed‘s Good Food Festival Saturday morning at UIC Forum. 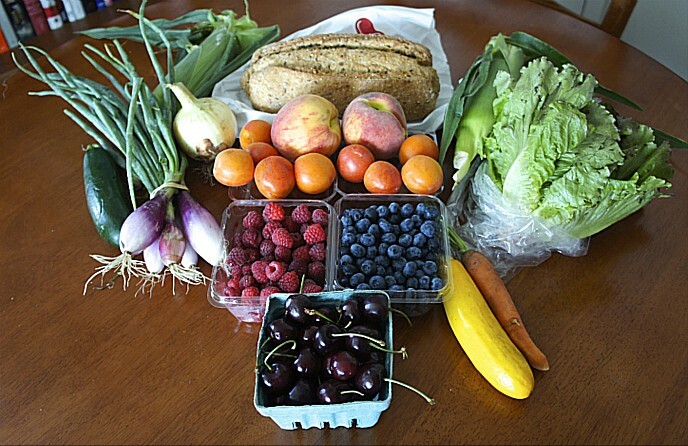 The Good Food Festival continues with great events and a hall with more than 150 food and farm exhibitors. The following are photos from Greg Wade’s presentation. For more information about Wade and Publican Quality Bread, please click here for an earlier story on Good Food on Every Table. Baker Greg Wade of Chicago’s Publican Quality Bread and One Off Hospitality Group making country sourdough at a Master Class that kicked off FamilyFarmed’s Good Food Festival on Saturday at UIC Forum in Chicago. 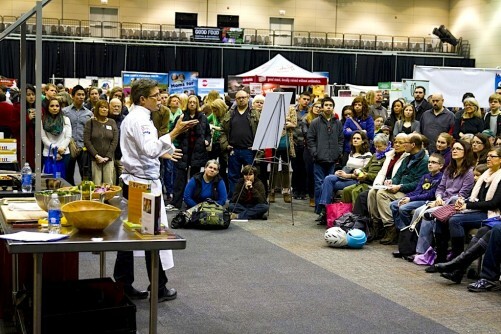 Baker Greg Wade working dough at his Master Class at FamilyFarmed’s Good Food Festival at UIC Forum in Chicago Saturday. Wade is head baker for Publican Quality Bread and One Off Hospitality Group. Baker Greg Wade with his country sourdough loaf, fresh from the oven, at his Master Class at Family Farmed’s Good Food Festival at Chicago’s UIC Forum Saturday. 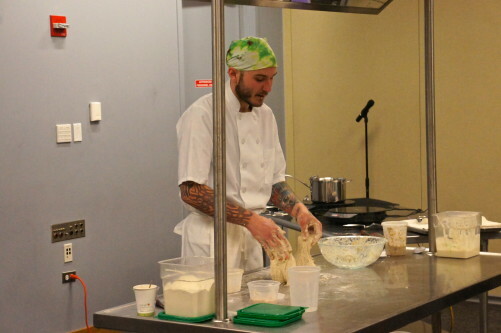 Wade is head baker for Publican Quality Bread and One Off Hospitality Group. 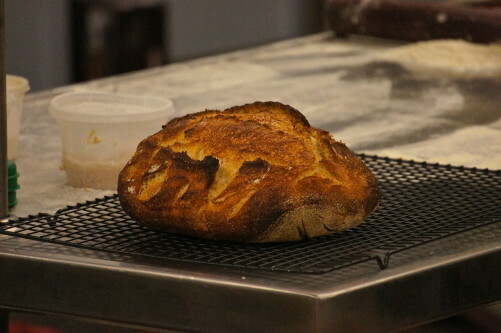 A country sourdough loaf, fresh from the oven, baked by Greg Wade at his Master Class at Family Farmed’s Good Food Festival at Chicago’s UIC Forum Saturday. 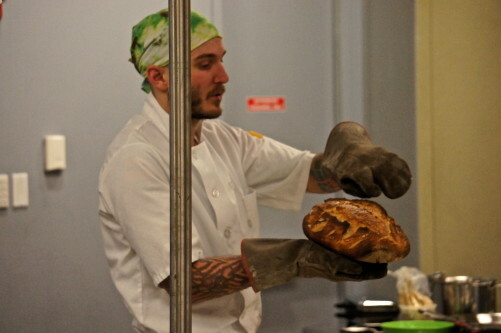 Wade is head baker for Publican Quality Bread and One Off Hospitality Group. This entry was posted in Bread, Food Artisans, Food education, Food Entrepreneurs, Good Food Festivals, Good Food movement, Sustainable dining, Sustainable food retailing and tagged artisan baking, bread, bread baking, FamilyFarmed, Good Food Festival, Good Food movement, Greg Wade, One Off Hospitality, Publican Quality Bread. Bookmark the permalink.